Wroxeter Roman City, near Ironbridge, has seen visitor numbers increase by more than 2,000% in the last month, according to English Heritage. 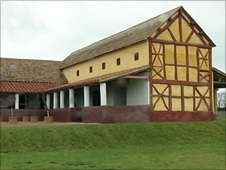 The organisation has explained the site's recent popularity on the Channel 4 series Rome Wasn't Built in a Day, which was based at Wroxeter. The documentary saw modern builders recreate a Roman town house, using only traditional tools and materials. More than 6,000 people have seen the villa since it opened on 19 February. The designs by Professor Dai Morgan Evans are based on a building excavated at the site. Located less than 10 miles from Ironbridge and Coalbrookdale, the birthplace of the Industrial Revolution, Wroxeter perhaps hasn't attracted the level of tourism that the site deserves. Originally named Viriconium, the city was once the fourth largest in Roman Britain. 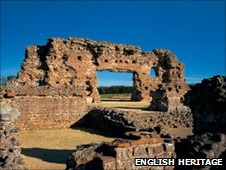 Ed Hall, the owner of the Wroxeter Hotel, hoped the site could be improved for visitors: "Wroxeter is a fabulous site, but much of it is hidden. English Heritage are looking at ways to develop the site - I'm hoping this will give them a boost." 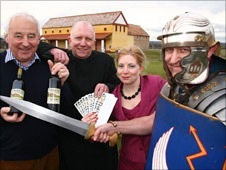 David Millington, who established the Wroxeter Roman Vineyard in 1991, believed the new villa would provide a focus for greater tourism to the area. Unlike other major Roman cities, such as London, Cirencester and Chester, Viriconium wasn't buried by subsequent development. Despite more than 100 years of archaeological excavation, just a small portion of what is thought to have been a 70-hectare site has been revealed, with much more lying underground. The city was established in 58AD as a legionary fortress, and thrived for more than 500 years. Lying on Watling Street made the city a key trade and military centre. However, it was much more than just a military fort. Administrative, residential and commercial properties were built. Some of them incorporated sophisticated, under-floor heating, mosaics and bath houses, demonstrating that this was far from a temporary base. It is thought the house recreated for Channel 4's documentary, incorporating its own baths, would have been owned by a wealthy merchant or administrator. After the Romans left Britain in 410AD, it is thought Viriconium continued to be used throughout the fifth and even into the sixth century. Experts believe Viriconium gradually fell out of use, until just farms were left. When Viriconium was abandoned, stone from the site was put to good use, including the later construction of the nearby church at Atcham. Britain's next invaders, the Anglo Saxons established their capitals not at Viriconium, but at nearby Wellington and Wrockwardine. Those areas, along with nearby Shrewsbury continued to flourish through the Medieval period, while Wroxeter was largely abandoned and reclaimed by nature. Even early excavation of the site in 1859 attracted tourists, including Charles Darwin. Over the years the ruins have also inspired countless writers and poets, including Wilfred Owen, AE Housman and Mary Webb.